The Volkswagen Golf has long been the favourite small hatchback of Practical Caravan’s tow car reviewers, and the Mk6 came to the test track promising to retain their allegiance. Our team tested the 2012 2.0 TDI Match 5dr, priced at £21,105. The experts expected to be rewarded with excellent stability and strong performance when towing. They were also looking for an enjoyable solo drive, a practical cabin and low running costs – read our VW Golf review to find out if the found what they were looking for. The VW Golf’s 1351kg kerbweight means an 85% match of 1148kg. It has a 1500kg legal towing limit and a 75kg noseweight, while this example's engined mustered 138bhp accompanied by 236lb ft torque. To see what tow car potential this hatchback has for your caravan holidays, we paired it with a Swift Expression 442 with a mass in running order (MiRO) of 1129kg. The Golf took 13 seconds to go from 30-60mph, while it needed 15.4 seconds to pull from 50-60mph in fifth. It held 60mph easily in sixth gear on a level road, but the testers had to shift back down to fifth to keep to the legal limit on motorway slopes. The hill-start test posed no problems. The handbrake held the outfit easily on a 1-in-10 slope, allowing the Golf to tug the van competently, but the clutch began to smell when the car reversed up the incline. If you need to halt in a hurry, the Golf’s brakes are fairly reliable, stopping from 30mph in 11.1m. It could have done better, but the car the reviewers tested was fitted with winter tyres. The temperature during our braking tests was a degree or two above 7˚C – the point at which winter tyres really come into their own. When they tested it with summer tyres in the spring of 2011, the VW did better. In the emergency lane-change test, the tow car showed impressive control and stability, never allowing the caravan to take charge and pulling the outfit straight no matter how violently the wheel was turned. Again, when Practical Caravan tested the Golf with summer tyres in the past, it performed with immediacy and grip. Driven less aggressively on public roads, the VW makes a very pleasurable tug. Few small hatchbacks are on the same page when it comes to high-speed stability. Even on a breezy day, our testers rarely needed to make steering corrections. However, on rough roads, the Golf remained comfortable, which makes it ideal for long-distance towing. The VW Golf has come a long way from its beginnings to become more of a car that can be enjoyed as a solo drive. Over a decade ago, it felt stodgy when compared with rivals, but today’s handles fluidly with little roll. At speed on country roads the VW feels poised and able. Our testers have previously driven the Golf with Adaptive Chassis Control (an £800 option) and summer tyres, and in this specification it feels even more at home on B-roads than the version tested here. Although it would be nice if every drive were on a deserted country lane, most cars spend more time plodding around town or ploughing up and down motorways. In more mundane driving conditions, the VW really proves its mettle. At low speeds, it smooths the road well. At motorway speeds, the Golf is relaxed and comfortable, and it accelerates with alacrity – hardly surprising given how well it behaves with a caravan in tow. Moreover, it does a creditable job of shutting wind and road noise out of the cabin. Although the VW Golf is a small hatchback, it boasts a fairly generous interior. In the front seats, there is plenty of headroom, although the legroom is not as impressive. Still, most drivers will find the right settings to get nice and comfy. The cabin will not ignite your sensory receptors, but the sober arrangement is a breeze to use, thanks to the ordered and logical system devised for the controls. Careful consideration has also gone into the rear seat bench, where passengers will enjoy plenty of leg and headroom, as well as blown-air vents. The Golf has a practical boot, as well, which starts at 350 litres with the rear seats up and reaches a maximum of 1305 litres when they are down. It is even more flexible, thanks to the 60/40 split-fold rear seats. Unfortunately, the seat backs don’t quite lie flat and there is a step in the floor when they are folded. Strong value is the key to the success of the Volkswagen Golf. Bargain as determinedly as you can and you can shave £1571 from the ticket price, according to What Car?’s Target Price shoppers, but the prices of rivals may drop more readily and further. VW throws in air conditioning for Golf buyers, but not dual-zone climate control, which its close rival, the Ford Focus, provides as standard. The Golf resides solidly in insurance group 21 and promises 58.9mpg on the combined cycle, according to official figures. 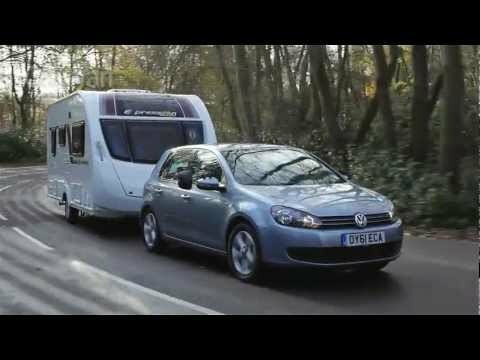 Around Practical Caravan’s towing-economy route, the Golf achieved 31.5mpg. The Volkswagen doesn’t skimp on important safety aids, such as stability control as standard. It has also achieved a five-star overall rating from crash-test expert Euro NCAP. A few years down the line, the VW Golf will hold its value well. Expect it to be worth 42% of its original price after three years and 60,000 miles. Anyone who finds the Volkswagen Golf a little too sensible for its own good – from its sober cabin to its school-run profile – will be pleased by its many advantages. With a tourer hitched to it, the VW is quick and stable at motorway speeds, when it also rides comfortably and dampens noise effectively. These qualities make it pleasant on long journeys, whether you’re towing or not. You’ll find the Golf’s cabin spacious as well as quiet. Passengers are well catered-for with leg and headroom, while the flexible luggage area is generous, no matter how many seats are occupied. Few caravans make an 85% match with the VW Golf, and while its stopping distance in an emergency is reasonable, it’s not outstanding. In most other respects, the Golf is a sensible buy, thanks to its high resale values and fuel economy.